The Bradbury-Pineland Corridor consists of a network of both polished and rough trails that connect Bradbury Mountain State Park (Pownal) to the Pineland Public Reserved Land (Gray, North Yarmouth, New Gloucester). 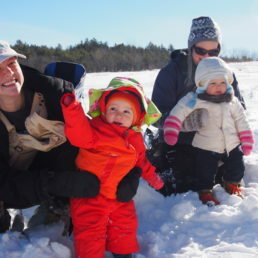 The corridor between Bradbury and Pineland Public Lands is a mix of trails on state-owned land, powerlines, and connector trails owned and managed by the Royal River Conservation Trust and the Town of Pownal. RRCT’s trails are known as the Elmwood Trails, connected to the Corridor. Bradbury Mountain State Park provides an exceptional mix of camping, recreation, mountain biking, picnic areas, playgrounds, and more. The Pineland Public Reserved Lands are forests surrounding (but not owned by) Pineland Farms — Pineland Public Reserved Lands are state forests managed for timber harvest and public access. Pineland Public Lands trail systems are entirely separate from — not connected to — the trail systems of Pineland Farms. Bradbury Mountain State Park is an exceptional resource for mountain biking, equestrian trails, camping, birding, accessible playgrounds and accessible picnic areas, and more. The State of Maine’s website for Bradbury Mountain State Park provides information on trails, rules, events, fees, and more. A self-led Natural Heritage Walk (Nature Walk) for kids is easy with this easily printed 8.5 x 11 PDF posted here. The Bradbury Mountain Hawkwatch is an exceptional initiative researching spring migratory raptors. Each year, RRCT sponsors Bradbury Mountain State Park’s weekend birding and youth event known as Feathers over Freeport (and Pownal). The State’s trail maps and park maps do not yet show the “Corridor,” managed by Park Rangers, which expands the Park to Tryon Mountain, Tryon Field, and more. See the “Maps” section below for RRCT maps that show these expanded state trails. RRCT’s current role — funding wheelchair access investments and other projects or assistance with charitable resources — is described as part of RRCT’s Rain or Shine Fund. The Pineland Public Reserved Lands are state-owned forests surrounding Pineland Farms, managed for timber harvest and public access. Loop trails provide mountain biking, dog walking, hunters’ access, and more. 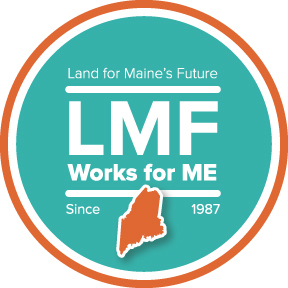 The State of Maine’s website for Pineland Public Reserved Lands and Maine Trail Finder maps of Pineland Public Reserved Lands provide some information, and decent trail maps; the State of Maine trail maps do not include recent “Corridor” expansions. See the “Maps” section below for RRCT maps that show these trail expansions. Pineland Public Lands trail systems are entirely separate from — not connected to — the trail systems of Pineland Farms. The Bradbury-Pineland Corridor consists of a network of both polished and rough trails that connect Bradbury Mountain State Park (Pownal) to the Pineland Public Reserved Land (Gray, North Yarmouth, New Gloucester). The corridor between Bradbury and Pineland Public Lands is a mix of trails on state-owned land and powerlines. The state-owned land is managed by state rangers of both Bradbury State Park, and also the State’s Public Lands Unit in Farmington. The powerlines are owned by Central Maine Power with recreational management only by the local snowmobile club. Trails in the Bradbury-Pineland network are primarily for hiking, trail running, and mountain biking. Especially in Pineland Public Reserved Lands Unit, only narrow planks help hikers and bike riders cross wet spots. Allowed uses on some trails in some locations along the Corridor also include skiing, snowshoeing, horseback riding, and snowmobiling. Please note that some of these these trails, especially those snowmobile trails along the CMP powerline corridor, will never meet the expectations of the average hiker or bike rider. They may be wet, and may not be mowed or bush-hogged. There is a lack signage for easy navigation except when snowmobile tracks are obvious. Bradbury Mountain State Park is on Route 9 in Pownal, just north of Pownal Village. A parking area and mid-point trailhead is located on the west side of Lawrence Road 0.9 miles north of Elmwood Road. The GPS address to use is 500 Lawrence Road, Pownal, ME. Various trails cross various public roads including Elmwood, Chadsey, Sweetser, and more. The primary trailhead for Pineland Public Reserved Lands Unit is on Depot Road in Gray. Mountain bike trails. The state’s formally named Bradbury-Pineland Corridor Trail begins at the junction with the Boundary Trail in the northwest corner of Bradbury Mountain State Park. From here, the trail heads west past Thoit’s Brook, and then a spur heads up to the summit of Tryon Mountain where you’ll find old quarries and opportunities to explore for minerals and treasures. As the trail winds through deep woods in state park land known as “The Corridor,” you’ll come across old stone walls and ledges. Upon reaching the parking area and trailhead at Lawrence Road, the trail then heads west past Tryon Fields, which are maintained for wildlife, scenery, and winter sledding. RRCT spur trails head north and south parallel to Chandler Brook (no mountain bikes are allowed on these spur trails). The main trail crosses Chandler Brook, which is stocked with brook trout. This is an inviting and accessible section; large bridges provide safe crossings of Thoit’s Brook and Chandler Brook. At the junction of state park land and the CMP power line corridor, the trail heads south to connect to the Pineland Public Reserved Land. The trails here are suitable for winter uses, but challenging in the summer at two bridge locations and some other wet areas. In many places the trails are CMP service roads; in other cases the trails are variable depending upon the extent of recent mowing and signage. Plan to dismount from bikes or walk carefully on bridges along the power line. Bridges along the powerline do not safely support equestrian traffic. Gates that are open in the winter may be closed in summer even though summer uses are permitted by CMP and Maine BPL. Soon after crossing the railroad, the trail enters the woods into the Pineland Public Reserved Lands Unit, headed toward New Gloucester Road (Rt 231). About 0.4 miles after crossing New Gloucester Road (Rt 231) the corridor trail connects to the primary trail loops at Pineland Public Reserved Land. 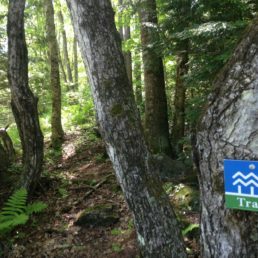 These trails are on state forests in Gray, North Yarmouth, and New Gloucester. They do not connect to nearby Pineland Farms’ extensive private trail networks. Because of multiple ownerships, please always refer to specific ownership sites (State Park, eg) as primary sources of rules. These notes below touch on some frequent questions. The state-managed “Corridor” trails are open for hiking, skiing, snowshoeing and bicycles and equestrian uses. Dogs are welcome, but on leash or voice control, with strict attention to pet waste removal. (Leashes are required on State Park trails.) Due to deer wintering, the State asks that dogs be on leash during periods of deep snow; deer struggle to maintain energy during the winter; dogs and humans cause them to expend this precious energy. Please also remove horse waste as well. Pet waste is a significant factor in the water quality of fishing brooks like Chandler Brook. Trails on Pineland Public Reserved Lands allow dogs and are open to the public at no charge. Nearby well-managed Pineland Farms trails do not allow dogs and require payment. Please respect various postings on abutting land; some of the Corridor is private land, with public deeded rights. Please comply with any and all posted rules or signs along the trail, especially respecting private property postings. Please stay on marked trails, and respect the many private landowners who both host marked trails and ask that their private trails, fields, and forests be respected. Some private landowners allow special public events or snowmobile usage on their trails upon request, but do not allow general public access. Hunting is allowed on or near many trails in the Corridor, but prohibited in some sections of Bradbury State Park, and prohibited by some private landowners whose land is crossed by trails. Hunters and trail users should always use caution and wear orange; trail users should consider using other trails during hunting season. Trails on Pineland Public Reserved Lands allow hunting and are open to the public at no charge. Please refer to the “Maps” section. RRCT manages a two-mile trail network (no bikes) between a trailhead at GPS address 854 Elmwood Road, and a trailhead at the Sweetser Road bridge in Pownal, running along Chandler Brook and connecting to the state’s Corridor trail. Because RRCT plans to continue to develop the trailhead and connectors at Elmwood Road, we are calling this trail network Elmwood Trails. The Elmwood Trails path is a series of trail easements across four private landowners; please respect all trail postings and recognize that the land on both sides of the path is private. Bikes are not allowed on this path. Horses, runners, hikers — and dogs under strict control — are welcome. The path is narrow and includes rocks and roots and wet areas — it is not accessible for trail users with mobility challenges. Parking is on the shoulder of Elmwood Road near a sharp curve with small signs (GPS 854 Elmwood Road), or on Sweetser Road shoulders. The state’s parking lot on Lawrence Road (Tryon Field, Tryon Mountain) provides year-round off-road paved parking for trails that connect to Elmwood Trails. South of RRCT’s trailhead at GPS address 854 Elmwood Road, a parcel of land owned by the Town of Pownal provides limited connectivity; an infrequently maintained trail leaves a town-owned Public Works fill area off Elmwood, and later connects to the CMP power line. The Corridor has not yet been mapped by the State of Maine. Stay tuned for new State maps in future years. Other mappers (2018) are beginning to map the full Corridor. Wending Maps & Wayfinding provides good current free mountain biking maps and guides at LL Bean, Freeport Bike & Ski, other bike shops, and kiosks. In total, the state Bureau of Parks & Lands ownership creating the Bradbury-Pineland matrix and corridor transitioned from 300 acres in 1970, to 2,085 acres by 2010, including 300 acres of Royal River Conservation Trust conservation easements and trail rights. 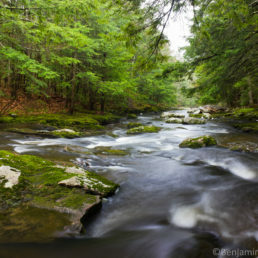 Various expansions of both Bradbury Mountain State Park and the Pineland Public Reserved Lands (PRL) Unit were among the first projects of both the Royal River Conservation Trust (then known as the Pownal Land Trust) and the then-new Land for Maine’s Future program. 2000 Libra transfer-expansion of land to the PRL. 2003 – 2007 Expansion to include park-managed PRL in Pownal (the Corridor and Tryon), with help from Land for Maine’s Future and Pownal Land Trust (now RRCT). RRCT conservation easements and trail parcels or easements buffer or connect to the park and the corridor. In addition to several trail deeds, 300 acres of RRCT conservation easement buffers exist off Elmwood, Lawrence, Sweeter, Chadsey, and Fieldstone Drive, including the iconic Knight’s Farm (now Bradbury Mountain Berry Farm) and two miles of trails along Chandler Brook in Pownal. This history of the Pownal Land Trust (now Royal River Conservation Trust), Bradbury Mountain State Park, Pineland Public Reserved Land, and conservation land in Pownal is richly detailed in a 2008 book, “On Pownal Time, One Hundred Years in a Rural Maine Town, 1908-2008,” as well as State management planning documents. The Royal River Conservation Trust is working with the Town of Pownal and Bradbury Mountain State Park to develop and publish maps of additional trail connections in 2019 or later. Contact us for more information on our plans.